From left: Hawaii Supreme Court Associate Justice Richard W. Pollack, Associate Justice Paula A. Nakayama, Chief Justice Mark E. Recktenwald, Associate Justice Sabrina S. McKenna, and Associate Justice Michael D. Wilson express their gratitude to the students and everyone who helped make the Courts in the Community a success on Kauai. LIHUE, HI – The Hawaii Supreme Court convened today at Kauai Community College giving more than 300 students the opportunity to view an oral argument in an actual case. Students from Kula Aupuni Niihau A Kahelelani Aloha (KANAKA) Public Charter School, Kanuikapono Public Charter School, Island School, Kauai High School, Waimea High School, Kapaa High School, and Kauai Community College attended as part of the Judiciary’s Courts in the Community outreach program. Since 2012, nearly 5,000 students have participated in this educational initiative to enhance their understanding of the Judiciary’s role in government, and see first-hand how it resolves disputes in our democracy. The court heard SCWC-14-0001135 – In the Matter of BCI Coca-Cola Bottling Company of Los Angeles, Inc. The case involves an employee who, upon return from a work injury leave, was not restored to her job because a replacement was hired. The employee alleges she was discriminated against “solely because” of the work injury, in violation of Hawaii Revised Statutes § 378-32(a)(2). Oral argument was followed by two question-and-answer sessions for the students – one with the attorneys and another with the five justices. To prepare for the case, students studied a curriculum developed by the Kamehameha V Judiciary History Center and the Students for Public Outreach and Civic Education of the University of Hawaii’s William S. Richardson School of Law. Attorneys from the Kauai Bar Association (KBA) volunteered their time and facilitated a moot court activity where students had an opportunity to argue the case themselves. “Courts in the Community is a hands-on civics education experience. 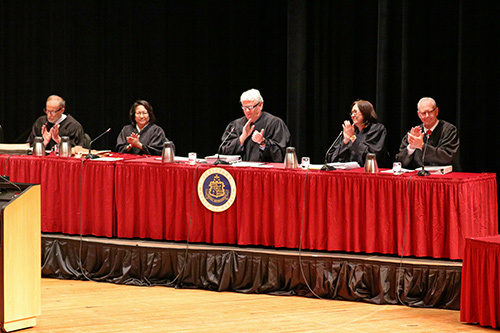 It gives students the chance to study the important legal issues of a pending court case, form their own opinions, and then see how the attorneys and justices deal with those issues in a real Supreme Court oral argument,” said Chief Justice Mark E. Recktenwald. “Through this program, we provide students with a better understanding of the role of the courts, and how the judicial process operates. “I would like to extend a special mahalo to the teachers, the Kauai Bar Association, the Hawaii State Bar Association, the Hawaii State Bar Foundation, and all the volunteer attorneys who helped make this happen. These invaluable partnerships are what make the program a success,” added Chief Justice Recktenwald. The Hawaii State Bar Association (HSBA) and the Hawaii State Bar Foundation generously provided the students with lunches and transportation. A program featuring the oral argument, and interviews with students, Supreme Court justices, and other attendees, will air on Hoike Kauai Community Television (Spectrum Kauai Channel 53 and 54), with availability on the Hoike website at: www.hoike.org. If you have any questions or would like to request additional photos or video of the event, please contact the Judiciary’s Communications and Community Relations Office at (808) 539-4909.